The Country Innovation Traveller Waistcoat is made from Stretch-Tec - a comfortable, stretchy, breathable fabric that is also fast wicking, durable and water repellent. 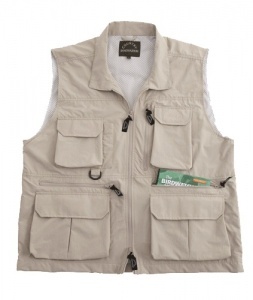 The 9 pockets are all of a useful size and the fold over collar prevents the rubbing of straps. It is the perfect load-bearing garment for the warmer climate and part of the Traveller range which includes shirts, trousers and jackets.